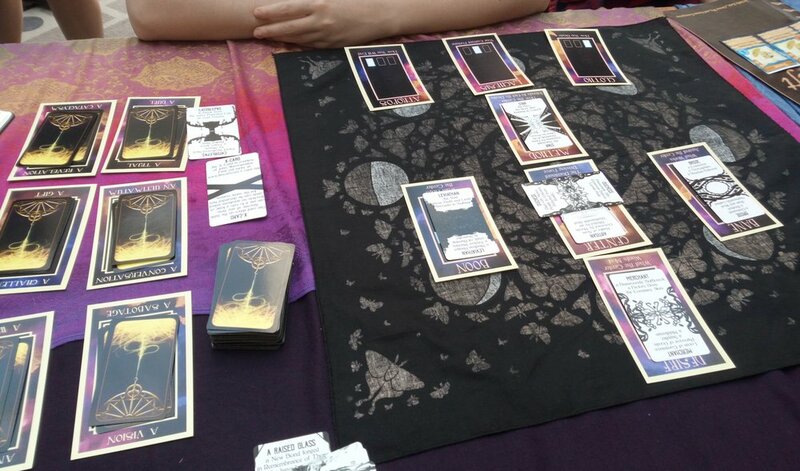 Spindlewheel is an interpretive tarot-like storytelling game where you weave together a story from card to card. The objective of the game is to tell a satisfying story. Your Character might win wealth and respect and come away from the adventure a better person; they might crash and burn, and end the story as a warning to others. Both of these are victories if they fit the arc of the story you’ve told, and bring satisfaction to you as a storyteller. Spindlewheel’s fundamental verb is interpretation. 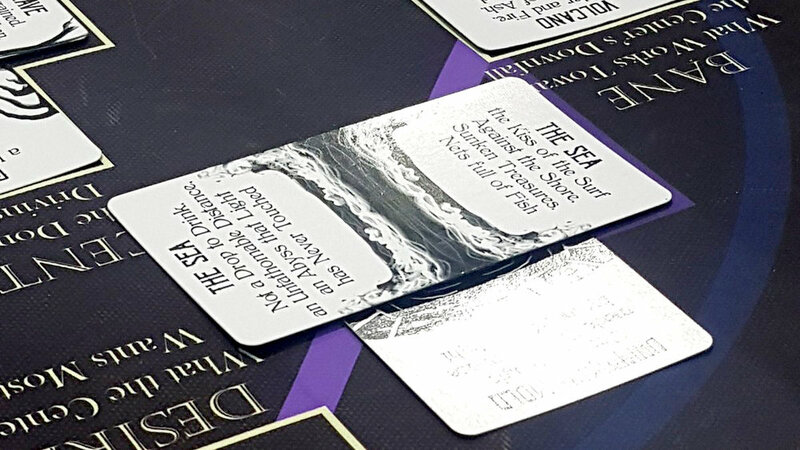 Each card’s text evokes an idea. The upright and inverse text are different. Sometimes they’re diametrically opposed; often, they’re two sides of the same coin. Use the card as an anchor for the part of the story that you’re telling. A card can be a person, an event, an attitude, or a physical object. Use as much as the entire card, or as little as a single word. A card is interpreted twice: once when it enters your hand, and again when you play it. It does not have to be the same interpretation. FOR EXAMPLE: I might draw the Hearth card and Reflect that I feel like people closed their doors to me; but I might Engage that card later, declaring I won’t do the same to someone else, and play it to invite someone into my home. Begin the game by interpreting a spread of cards together, and collaboratively building a World. 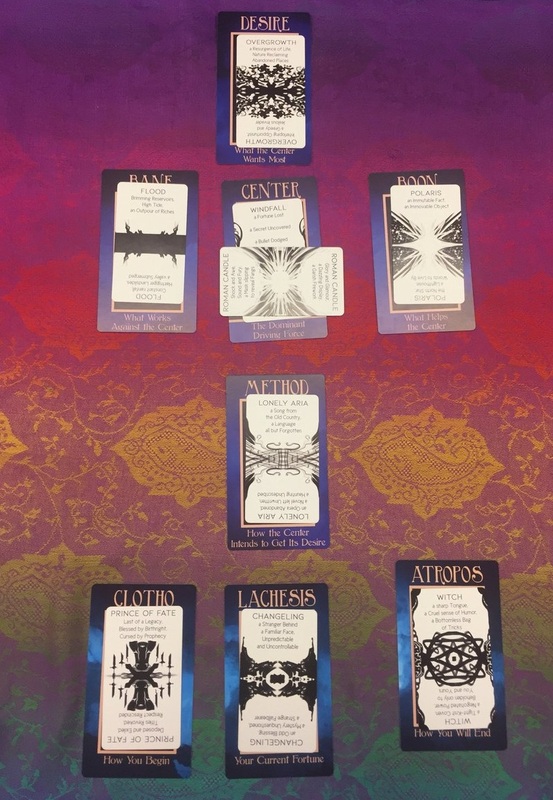 Individually, interpret a spread of cards to create your Character, reading their strengths and weaknesses, their methods and their heart’s Desire; take a glimpse into their history, and potential end, with their Clotho, Lachesis, and Atropos cards. These cards become your hand. In play, you’ll use these same cards to describe what your character says, does, or what details you add to the story; or, draw from the deck to introspect, and reflect on how your character feels or changes. Use the concepts in the cards as anchors to justify your actions, as inspiration to add details and color to the scene, or as the jumping-off point for an idea you’re excited to explore. Spindlewheel is a loom on which you weave stories, placing cards like threads to intertwine and complicate the tale. It’s also genre-agnostic: The deck might give you a Princess, a Plague, a Witch with a Cursed Sword, a Trickster, and a Tin Penny; whether it describes the fate of a kingdom or a bizarre encounter at a bus stop, is up to you! Spindlewheel is also featured on An Atlas of the World Unknown as part of Looming, a hack of Avery Alder’s the Quiet Year. Thank you to University of Irvine for featuring Spindlewheel: Detective in the arcade! Read some of the stories told here. Thank you so much to Austin Ramsay for showing Spindlewheel: Detective! Thanks to everyone who played Spindlewheel: Detective at Indiecade! Spindlewheel was featured in the Arcade at the Queerness in Games Conference in Montreal this year! 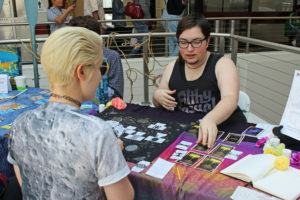 Spindlewheel had a wonderful showing with Playdate at LA Zine Fest! Spindlewheel had a great showing at Protospiel San Jose! Click through here to see a twitter thread of some of the amazing stories told at the convention.